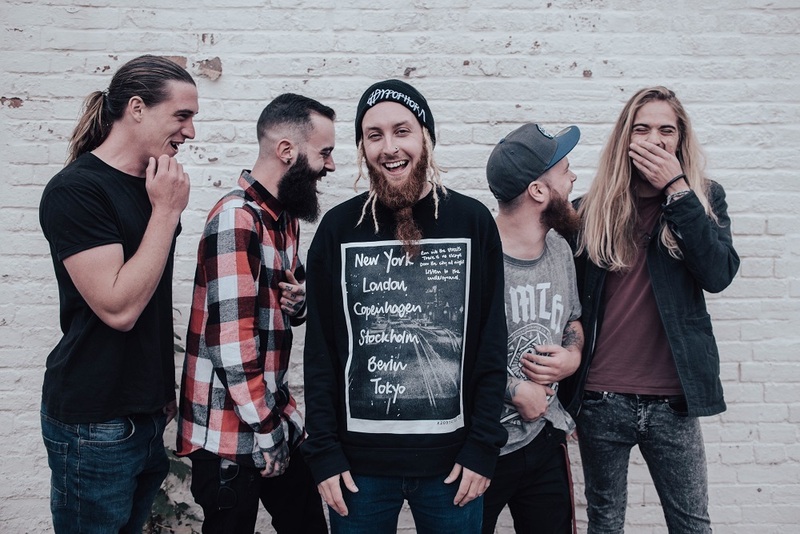 Five-piece rock/alternative band Lady Jane’s Revenge are Billy Crook (vocals), Sam Kent (guitar), James Coffey (bass), Ash Jenkin (drums) and Adam ‘Clemo’ Clemens (guitar). They’ve got two EPs to their name, 2016’s 1554 and 2017’s eponymous release, and now they are back with ‘Pure’. We spoke to the band to find out more. We just wanna help keep pushing an open minded and morally good existence, which fortunately in recent times has grown magnificently towards gender, race, species and beyond. You know… “Unite! Not separate”. First up, tell us bit about yourselves - who are Lady Jane’s Revenge, and what were you doing before making music together? Lady Jane’s Revenge are a Rock/Alternative Band from South-West, UK and we have been together since February 2015. Before the band, we were all living completely different lives… Our drummer Ash had been working as a hospital porter in Bristol, with his then partner and paying for a mortgage, before suffering a break-up and returning to his hometown in Cornwall, where bassist James had also been living with his partner and toddler at the time after a period of moving around Yorkshire and Wales. Sam had moved to Cornwall from Brighton where he worked as a mechanic, for the surf culture and was living out of caravans, while taking up seasonal work in a restaurant, throughout the days he worked hard on honing his guitar skills and hitting the waves. Vocalist Billy made the move down from Camden Town in London, seeking a better quality of life for his daughter after leaving his job at Apple. Our recent addition to the band Adam, had been a delivery driver in Cornwall and gone through a traumatic relationship breakup. Before this project we have all dabbled in previous bands in the past and tough life experiences.. The band has connected us in a very therapeutic way. I wouldn’t’ say we have taken inspiration from anyone specifically, we do have a broad range of influences… Although there’s never been anyone we have pinpointed as someone we want to copy. We go with the flow of our emotions and spirit in the moment of creation. Why the name ‘Lady Jane’s Revenge’? Without going too in depth with the British history of her, we use Lady Jane Grey as a metaphor with our name, she was pressured against her will into a situation for someone else’s purposes and tortured and beheaded. The word ‘Revenge’ connects to her name for us, because we want to be a voice and inspiration to those out there, being used or manipulated to stand up and fight against that scenario, while learning self worth and be aware of just how powerful you can be, if you just believe in yourself. We are a rock/alternative band, from south-west, UK. For fans of The Used, Incubus, Faith No More. We feel we are unique and refreshing for our genre, because we incorporate each of our different favoured styles and create something unexpected with each song, our vocalist has an unusual voice for rock, due to growing up in inner city London surrounded by many wonderful cultures, if you want motivation and a real look at the world then check us out on your fave music platforms. Damn!! Too hard, we all have so many influences and enjoy different music to everyone else in the band. It’s too hard to pick. Tell us about your new single ‘Pure’. What’s it about? The message is one that tries to invoke the memory into the listener, of a time when they were young, free of judgement and behaviours against “different”, therefore reminding them also with the chorus, that we have opinions and views forced upon us by elders in our lives and mass media propaganda. We wrote this song our first week back after Xmas and New Year in January 2018, after we had previously dropped our Self-Titled EP alongside our show with Crazy Town. We worked on the musical side of things and James our bassist presented some lyrics which I created a melody for, it was actually a very fun and quick process, with the song easily entering our show setlist. We demoed it in March, and then once again after Adam joined us as a second guitarist in July. We went against our usual process of bedding down for a week with a producer in a studio, so we could keep as much of our saved up money for promotion. We decided to give our guitarist Sam a shot at proving himself up to the task, after his time learning the music production trade at University, and we have been pleasantly impressed! How does ‘Pure’ build on your style? Now that we are a five-piece, having the extra guitar and energy beside us, is a huge boost to the sound and atmosphere. We did a lot of assessments judged off our previous work and pinpointed a few techniques and also things we felt we lacked before, and went about adding little things extra here and there. We feel like this song has levelled up in every way. What are your hopes for ‘Pure’? Our hopes have always been for it to get a positive reaction in the listeners and get them thinking about the words. We really wanted this video and song to gain us more exposure and bring bigger gig offers our way, as our location hinders us much more than artists in a city environment, and we struggle to get accepted for chances in the big cities. Yes, our intention is to release three singles in 2019! Pure being the first, and we have a few demos in our back pocket that need to be recorded properly, in which order we will release, we are still unsure. We plan to record them ASAP, and we have been jamming fantastic new ideas too. We just struggle to find the time to do it all quicker, perhaps a record label can help us go full time? Wink wink, hahaha. We have shows booked in, and currently taking on more. Oh man, there would be more than one piece, haha, believe that. The biggest struggle we have is enough money, every single part of being a band consists of “do we have enough money to do this or that”, so the advice would have been… Each of us save up a good chunk of cash now, before starting! Watch the video for ‘Pure’ on YouTube below.